I have a new favorite veggie: Parsnips!! I don’t know why I always shied away from them. I guess it was their alien-esk appearance to a carrot. I’m weird like that. I get freaked out by unusually large produce as well. You? Just me? OK.
It’s pretty obvious that my Coconut Chicken Curry recipe contains parsnips 🙂 Parsnips come from the same family as parsley and carrots. I could imagine their greens are quite tasty. The parsnip is supposed to have a sweeter flavor then the carrot. (Parsnips have 4g of sugar per 1/2c.) However, when I added it to this curry, it reminded me of a white potato. Perfecto! I’d like to try them roasted. I’m sure that would bring out the sweetness. Back in the day parsnips were used as a sweetening agent. Europeans would use them to sweeten cakes and jams before sugar was readily available. They are still very popular in Europe. A famous dish called “neeps and tatties” is well known in Scotland. Can you guess what they are referring to? Get your head out of the gutter. Parsnips and Potatoes, of course. 1/2 c of cooked parsnips delivers 3g of soluble fiber and only 55 calories. Soluble fiber helps lower cholesterol and the risk of developing diabetes. And, as you know, fiber is great for our digestive system. It also helps keep you full, which aids in weight loss! Parsnips are a good source of Vitamin C (17%) and E (7%). These antioxidants help neutralize free radicals (disease causing rascals). Vitamin C boosts the production of white blood cells to help fight off infections and brewing diseases in the body. It also assist in the production of collagen. Did you hear that, ladies? I would say this is an anti-ager. Yes!! Vitamin E protects our immune system and our eyes. It lowers our risk of age-related cataracts. 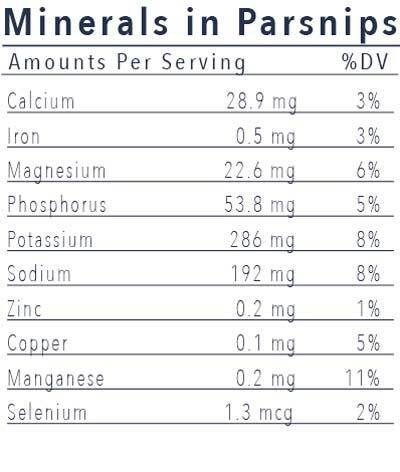 They contain 11% of our RDA for Folate and 286mg of Potassium. These little guys, together, help maintain a healthy heart. Potassium regulates blood pressure and a rhythmic heart. It also aids in metabolizing carbs and building muscle. Be careful not to consume too much potassium. In excess, it has also been known to cause irregular heartbeat. Folate helps metabolize homocysteine. High levels of homocysteine have been linked to cardiovascular health issues and atherosclerosis. Derived from the metabolizing process is an essential amino acid, methionine. Read up about its perks here. Folate also has the ability to reduce neural tube birth defects in infants. Make sure you are taking the supplement folate, not folic acid. Folate boosts the nervous system and energy production, as well as helps fight against depression. Manganese (11%) helps control the levels of sugar in the blood. This is great for a diabetic! It also helps you absorb other vitamins such as B and E. Manganese is an important factor in the proper functioning of your thyroid gland. It is an amazing mineral but should also be used with caution. If you would like to know more, carry on here. They contain 21.1mg of Choline. Choline is a very important essential micronutrient. Without it, we put our liver in huge risk of failure. It helps transport fat from your liver to other cells throughout your body. Fat accumulation in our liver is not good. Choline is also very important while you are pregnant or nursing. It helps with the development of the brain and nervous system. 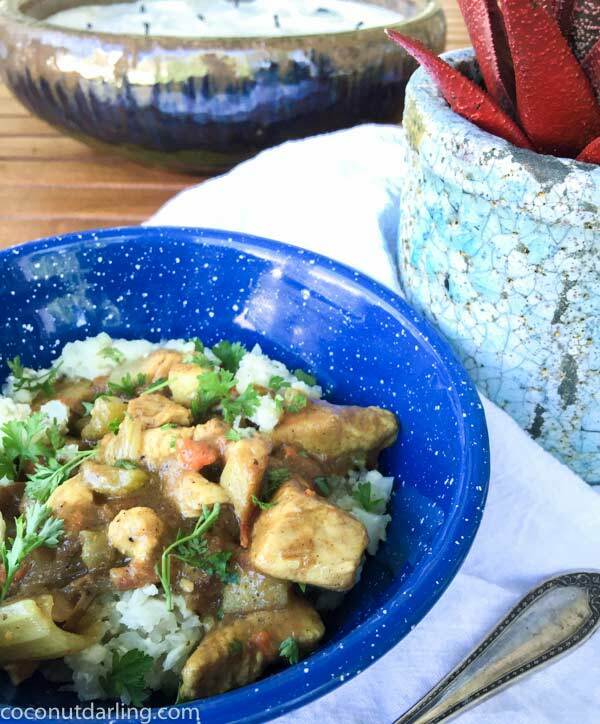 I found a great Chicken Curry recipe over at Paleo Flourish Magazine. I only had to make a few adjustments to it to suit my needs (or my pantry 🙂 ). This stuff was unbelievably good! I ate on it for three days. Add the diced bacon to a large pot. Cook until almost done and add your diced chicken. Once the chicken is browned on all sides, add the coconut cream and chicken broth to the pot. Stir until the liquid is all mixed together. Bring to a boil. Add the remaining ingredients (except the parsley). Bring back to a boil. Lower the heat to a simmer, cover with a lid and cook for 40 minutes. Do a taste test. Add more salt if needed. 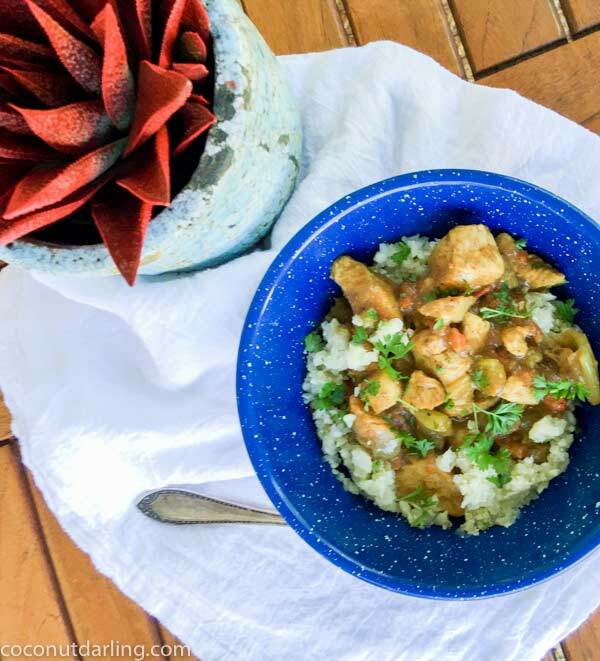 Serve atop cauliflower rice for a gluten free option. Top with parsley. Put your oil in a medium size pan on medium heat. Place the chopped cauliflower (minus the leaves and stem) in a food processor and pulse until you have reached a rice like consistency. Place the "rice" in a hot pan. Stir occasionally. Cook for several minutes. You still want the "rice" to have a crunch to it. Once it's reached your favorite level of "doneness", remove it from the pan to serve.